The Southwest Rapid Rewards Premier Business Credit Card currently has an Informr score of 8.4 out of 10. This score is based on our evaluation of 10 sources including reviews from users and the web's most trusted critics. Southwest Rapid Rewards Premier Business Credit Card is typically available to those with good credit scores (650 or greater). The Southwest Rapid Rewards Premier Business credit card is a high-value airline card that makes it easy to earn flights, gift cards, rental cars and more. If you’re a frequent flyer with Southwest Airlines, the annual fee is next to nothing especially after all the perks, rewards, and benefits. Overall, for business owners who travel often, the Southwest Rapid Rewards® Premier Business Card can be a valuable addition to your wallet. For business owners who travel often, the Southwest Rapid Rewards Premier Business Credit Card can be another ideal card that can be add into their wallets for use. If you are frequently flying Southwest Airlines for business, the Southwest Rapid Rewards Premier Business credit card should have a place in your wallet. It offers an impressive 60,000 points upon signup and tier qualifying points for spending throughout the year. But the biggest reason for having this card is the ability to fast track your way to the highly sought-after Southwest Airlines companion pass. 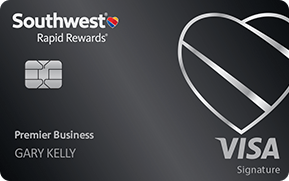 Southwest Rapid Rewards Premier Business Credit Card gives a great sign-up bonus. And with the yearly anniversary bonus, the annual fee is easily justified. It's best if you can spend enough to get the Companion Pass and/or elite status. That would give you the most value. But keep in mind that you would need to be a pretty big spender in order to reach the total points needed. Think about if your business can realistically do that. If you live in a city served by Southwest Airlines, the Southwest Rapid Rewards Premier Business Credit Card can help you rapidly earn rewards towards flights. This card is the big brother card to the Southwest Rapid Rewards Plus Business Credit Card with the same sign-up bonus and rewards structure but with some extras at a slightly higher ownership cost. The Southwest Rapid Rewards Premier Business credit card from Chase offers a serious 60,000 points sign-up bonus. Since Southwest flights are incredibly flexible and Rapid Rewards points are worth at least 1.58 cents each, this sign-up bonus is valued at about $750. The Southwest Rapid Rewards® Premier Business Credit Card is a good card for people who want help qualifying for the Companion Pass or want to earn elite tier qualifying points. Great only because Southwest is an excellent airline. On the down side, this credit card doesn’t offer anything in particular that makes it worth the fee. The Southwest Airlines Rapid Rewards Premier Business Card is not the most luxurious business travel card around. If you’re okay with practical benefits, such as Rapid Rewards Premier Business’s lack of change fees and free checked bags, this card should suit you fine.